Old Man Sea Fishing. Anyone who knows me knows that it would be rare for me to call someone �old man�. I had talked to this gentleman and that�s what he claimed his name was. At any rate after swimming with my family for quite some time and observing the schools of fish close to the shore I decided to sit up on the beach. The fact we seen a shark jump after a fish and the fact im petrified of sharks helped this decision. I began to watch the sea and the Old Man fishing in it. 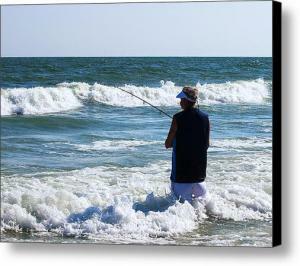 He was getting pounded by the surf but it did not seem to dissuade him from casting out and just waiting while standing knee deep in the ocean water at Myrtle beach SC. Do not get me wrong at one time in my life I was a die hard fisherman but the thought of the teeth on some of these ocean fish has kinda kept me from pursuing fishing for them. If you look very close behind the wave that was about to hit the fisherman next you can see the shark in the water. I did not see the gentleman catch a fish while I was photographing him but as we were leaving he was reeling in a rather large fish, or so it seemed. I give him cudos no fear, enjoying his sport and probably enjoying the sheer beauty of the ocean as much as I was. I will probably never swim deep in the ocean water like many but I know that next year during the season I will be back, with my camera and family enjoying the salt water I once feared and enjoy it with the reverent respect that it deserves. The Atlantic Ocean is a long way from the great lakes, the area which I grew up, but I now see what the draw to the ocean is and look forward to being drawn to it once again.